This is a very special watch to me. It’s my late grandfather’s watch and it’s the watch that started my love for vintage watches. A Moritz Ancre with a Lorsa 238A movement. It doesn’t have a French shock protection system as usual. Instead, it has an Incabloc. It was his daily beater and since he was a roadworker it took a lot of beatings. After I inherited the watch, I wanted to have it restored to its former glory to wear it. Many watchmakers advised against it since the costs would far exceed the value. That really got me into watchmaking and restoring timepieces. 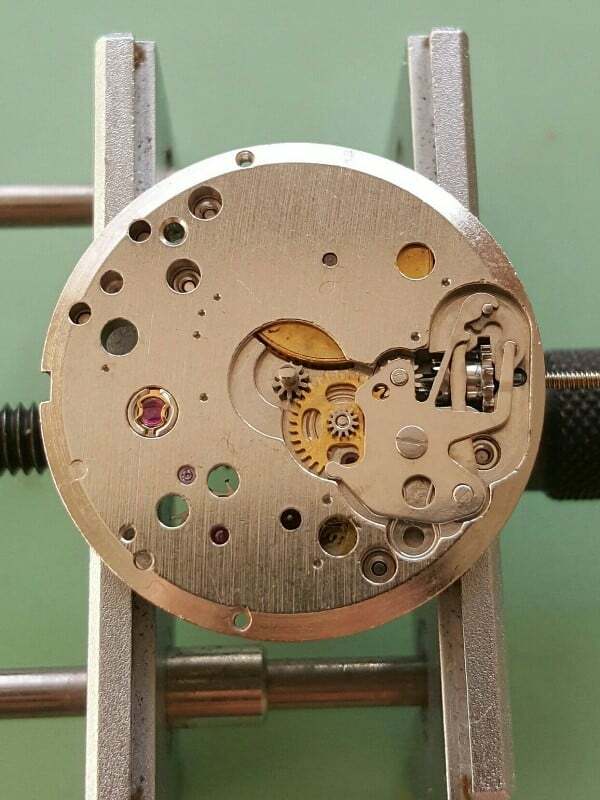 I started to restore it myself and later I found a watchmaker who was happy to service the movement for me. He did a great job and I’ve been wearing it with pleasure for years. It’s due for a regular service, so here we go. Move the click away from the ratchet wheel and let the crown slip between your fingers. Remove the balance and the pallets and store them safely on the bench. Flip the movement to pull the cannon pinion. This will allow lifting the center wheel later on. Remove the ratchet wheel, the crown wheel, and its shim. Remember that the crown wheel has a reverse-fretted screw. Remove the click and the click spring as well. Lift the barrel bridge and then remove the wheel train bridge as well. Lift the center wheel, 3rd wheel, 4th wheel, and finally the escape wheel. 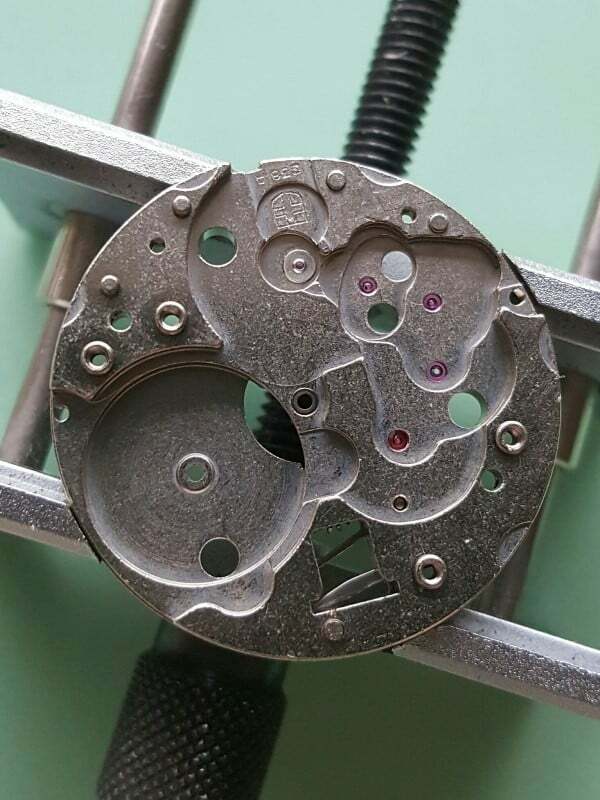 Remove the main barrel to complete this side of the movement. Turn the movement around and remove the keyless works. Then move on to the motion works. I clean everything in a vintage Elma watch cleaning machine. 3 baths and a heat chamber for 6 minutes each. Start with the main barrel. Then the gears of the wheel train. The escape wheel, 4th wheel, 3rd wheel, and finally the center wheel. Slightly lubricate the post of the center wheel before you place it. Fit the wheel train bridge and the barrel bridge. Lubricate the center wheel bearing jewel with HP1300 or D5. Lubricate the other bearing jewels with 9010. Install the click, click spring, and the ratchet wheel. Reinstall the crown wheel. Remember the left-handed screw. Lubricate the shim slightly with HP1300 or similar. Flip the movement around to install the motion works. Then, install the keyless works. Lubricate the cannon pinion, return bar with its spring, winding pinion, clutch and the winding stem with 9501 or similar. Flip the movement back around to install the pallets. Lubricate the exit stone with a tiny bit of 9415. Install the balance and see it come back alive. With the movement running you can now clean and lubricate the shock protection. Start with the one on the top plate. Remove the jewel hole and the end stone. Clean them in One-Dip or similar and slightly lubricate the endstone with 9010. I hope to enjoy this Moritz Ancre for many more years. Do you have a similar heirloom or special watch? Tell me about it in the comments below.